By far the most popular food item you will come across on the Hawaiian islands is the Kalua Pork or Sweet Pork. 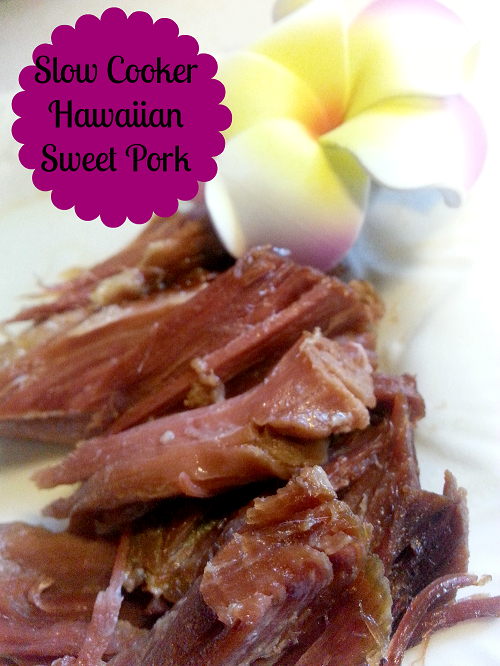 This is literally on every menu you browse and put into sandwiches, wraps, casseroles and more, so we have created a great make at home version of Slow Cooker Hawaiian Sweet Pork that will leave you feeling like you have stepped foot on the islands once again. This simple dish includes only a few ingredients but will remain a standby for your winter month slow cooker meals as it is so versatile once cooked. In medium bowl mix together brown sugar, liquid smoke, soy sauce and pineapple juice. Rinse and pat dry pork roast. Using fork pierce roast all over and place in slow cooker. Pour sugar/juice mixture over pork roast and allow to cook for 5 hours on low. Remove roast from slow cooker and let rest for 15-20 minutes. Using forks shred pork for sandwiches, wraps, tacos or to be served alone. Pour drippings from slow cooker into medium bowl and refrigerate for 1-2 hours or until liquid separates from any fat. Remove fat from top of liquid. In medium saucepan bring liquid to a boil, adding in ½ cup water. Use this as sauce over meat.